This weekend (and almost all week), W played with his friend Matt from next door (who turns 10 this week). Nerf gun wars is still the game of choice and thankfully we have a nice backyard to play in. He also went to the playground for hours, playing basketball and manhunt. Tuesday Wayfinders in Central Park was lots of fun. It was a rainy, muddy adventure, and W loved every second of it. There looked to be about 40 kids - mostly boys between the ages of 9 & 12 (with some older and younger thrown in too). The premise is a sort of game like Capture the Flag. Each were given a foam sword (think: pool noodle) and were told to battle and then die like you mean it, rolling on the ground, writhing. I thought the guides were hysterical. W went home with one of his best friends and slept over. On Wednesday, they had an awesome Pokemon party at the house. Tons of Pokemon decorations, prizes, goody bags, pinata, etc. The kids wore Pokemon T-shirts, Pokemon was playing on the TV, there was a table with How-To-Draw Pokemon books and tons of paper and colored pencils, and I counted more than 15 kids there. I got there at around 4pm to pick W up and then go to work. I was so impressed at how this mom put together such a cool party so quickly. I have party-planning-phobia and get nauseous even thinking about throwing parties. She inspired me, though. I may have one myself one day. Academics this week included the new math workbook. Flash Kids 4th (and 5th) grade gives a great review of what W has already done in TT5. The thing I've learned about math is that my kids may have seemed to master a concept, but without continuous practice, it fades a bit. The review workbook ($6.95 - $5.25 after discount) is a great idea for now before we continue onto pre-algebra. He'll be reviewing addition, subtraction, multiplication, division, place value, angles, perimeter, area, decimals, graphing, & inequalities. Then we'll finish up TT5 before the fall and combine that with Flash Kids Grade 5 and he'll do fractions, measurement, percents, exponents, and more advanced versions of the basics (like multiplying with exponents and graphing coordinates). We also read more of Robin Hood. The original language is difficult (reminiscent of Shakespeare with it's "dost thou art"s), but I decided to stop paraphrasing. I now read it as is - with as much inflection as possible - and W gets it. I asked him what he thought was going on in a certain part and he gave me a great narration, along with his own thoughts on what might happen next. We're also continuing with Joan of Arc. We're almost done with that one. It's not his favorite, but I do try and make the bloody battles really exciting for him, lol. He did a whole page in the Spelling Skills book. As he read me the new words, I noticed he said behind for beyond, cannon for cotton, button for bottom. If I have him slow down and try again, he usually gets it right. He is definitely getting more right than wrong, though. The 2 spelling activities were classifying and answer the questions. This gets W to write out the words which helps him remember how they're spelled. In the Spectrum Phonics & Word Study book W looked at a picture and circled the word as to what the picture was. Now that sounds simple and I remember similar activities being done in preschool, but again, it was like it was made for him. One of the pictures was of a desk. The 4 words given were: deck, disk, dock, and desk. W tends not to look beyond the first and last letters, so he chose "deck". I told him to look at it again and he caught the mistake. So this is the kind of thing he needs to overcome. I feel it's because he rushes through his reading and skims over words too quickly, and that causes one word to look like something else. Thankfully when he reads books he has to backtrack and correct himself or it won't make sense. The other activity in that book was changed the given word with a new vowel so it makes sense in the sentence. This can get tricky for him, but he got them all correct. I love this book. (The one I have is the OLD version with the pig on the cover - NOT the new one with the light blue cover. The new version has changed the inside contents as well. I just prefer the 1999 version not the 2006 version). W also read a few pages of Cricket in Times Square. He's taking his time with it, which is ok since it's all about understanding. I'm also thrill about him still loving those Pokemon cards. He reads them constantly. One very popular method of helping a slow reader is by having them read nonsense words. This way they have to use more than just the immediate picture of the word, they have to actually sound it out. Pokemon is full of that and I don't even have to schedule it into our day! The girls love having the week off. K is more than ready to get to the end of senior year. She has a meeting next week with an advisor at college to create a schedule for the fall. Prom is on K's mind all the time, too. She chose this beautiful dress and MIL offered to pay for the shoes and hair. 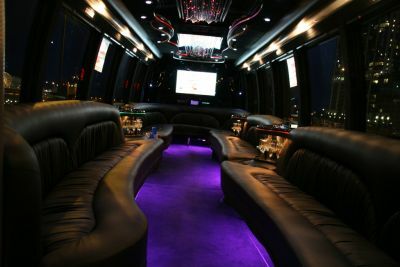 In lieu of a limo, about 15 of K's friends will take a party bus to the venue. I love that idea. It's huge inside, with a great stereo system, flat-screen TV, refrigerator, and bathroom. Way cooler than a limo. The picture to the left shows what the inside generally looks like. K has also been working and hanging with friends all week. And we joined a gym together! We've been going every other day. I love going with her. J has been busy with dance and friends all week. I spent some more time planning her summer. Her school requires continuous dancing throughout the summer. She'll certainly be busy all summer. She's starting with a workshop in Manhattan for a week, then Nationals for a week with her team, then the rest of the summer is dance almost every day - in Manhattan. She's so comfortable navigating through Manhattan now. Subways are easy and she revels in the whole atmosphere. On Tuesday this week J was part of a master class with Ellenore Scott (top 4 in season 6 of SYTYCD). Not many knew about it and only 5 people were in the class. J brought 2 friends and 2 older girls showed up. Later in the day, Ellenore was giving a master class at Broadway Dance Center, which I know was packed, but this earlier class was at a lesser-known studio. I thought it was the luckiest thing ever. So much individual attention and focus.